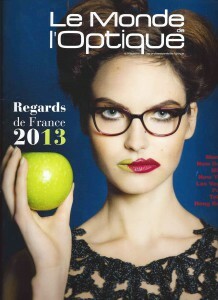 Every year, new brands enrich the heritage of the French eyewear business. This is one of the nation’s strengths and proof, if needed, of its vitality. Fo the most part, young designers confidently express their view of the optics industry’s future. Their watchwords? For many, pure French manufacturing and an innovative economic model. For all, an uncompromising dedication to working with materials and the technological element of their designs. We profiled six of the latest generation n French eyewear. He is probably the hottest sensation of Silmo 2012, where he unveiled his very first eyewear collection. But thirty-something Damien Fourgeaud is no new face in the business; he has some ten years’ experience under his belt in eyewear (and watch) design. ln th eearly 2000s, Damien Fourgeaud, then a 21year-old young graduate, broke into the luxury sector. He was hired by Christian Dior as a watch and eye wear designer and worked for Hedi Slimane and John Galliano. Two years later, the avid surfer left to Join Quiksilver as chief watch and sunglasses designer for Quiksilver and Roxy for the international market. Then he headed to Amsterdam, where he redefined the footwear and luggage lines for another big name in surfing: O’Neill. The year 2009 marked a turning point: he lent his talent to other brands and quickly became the common denominator among Cébé, Oxbow, Daniel Hechter and Christian Lacroix, to name but a few. 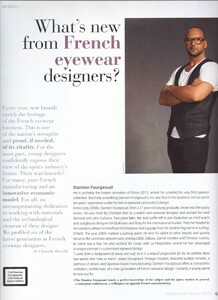 He also worked for Lissac with La Mezzanine, where he has developed a unique concept in customised eyeweardesign. « I come from a background of luxury and surf sa it is a natural progression for me to combine these two worlds that i love sa much », states Fourgeaud. Vintage-inspired, beautiful acetate veneers, a plethora of details and Oyonnax-based manufacturing: Damien Fourgeaud offers a characterful collection, emblematic of a new generation of French eyewear design. Certainly a young talent to look out for. The Damien Fourgeaud touch: a perfect knowledge of the subject ant the optics market in general, a contagious enthusiasm, a willingness to upgrade French manufacturing.